I assume you are talking about the inputs when they are configured as 4-20ma, its about 100mA max for all inputs combined. When the inputs are in votlage or dry contact/ thermistor mode the current is negligible. 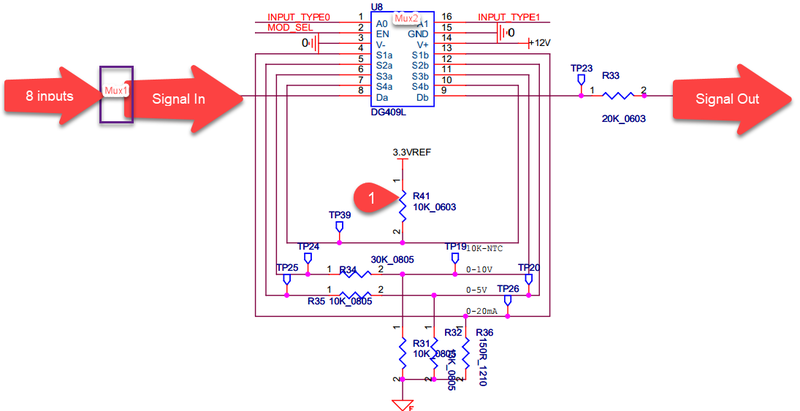 When the inputs are configured in dry contact what is the bias current value and under which DC voltage? And for your reference, here’s a simplified schematic of the input signal handling for the Tstat8, there are fuses and MOVs to protect the hardware which are not shown here. Eight inputs are first muxed into a single channel by Mux1 and then Mux2 sets the signal type to 4-20ma, 0-5V, 0-10V or thermistor/dry contact. There’s no jumpers to move around on the circuit board, the signal type is selected when you set the range and signal type in the T3000 software. You can see the 3V pullup resistor at Tab1. So if I understand correctly, regardless of its power supply (24 V DC or AC), the TSTAT always sends on its 8 inputs, a current of 0.3 mA under a DC voltage of 3 V.? There is no relationship between the input pullup voltage and the supply voltage, correct.